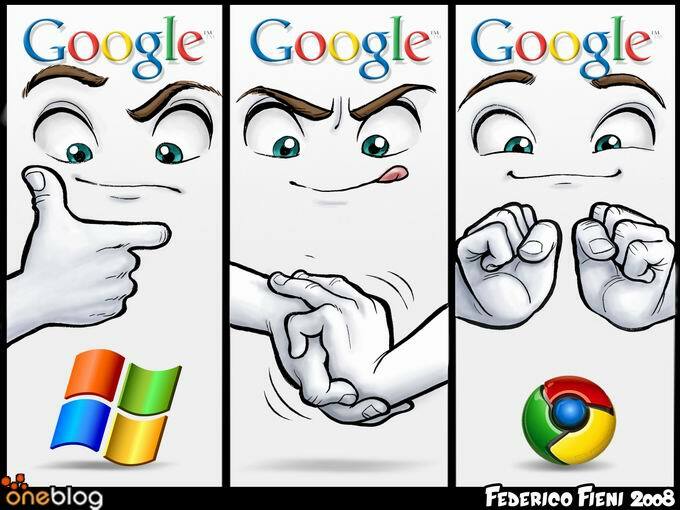 Federico Fieni: Google Vs Microsoft = Chrome? Google vs Microsoft = Chrome? Especially after the sticker Google vs. Microsoft. Because someone was looking at the bigger size to make the print available here at high resolution. Some advance about upcoming projects: the cartoons continue idiot (it is just me), publish a short strip "amaristica" and I intend to start an online comic theme .... I do not know yet. I have too many ideas. Maybe I'll make a poll here on the site. Published with permission from Federico Fieni and oneComics. Interested in: Drawing, Free thinking. oneComics is dedicated to the cartoons. oneComics follows the daily events and represents them with cartoon strips and illustrations with a hint of satire.